Between 1870 and 1920, over a million Swedes emigrated to the United States, primarily seeking greater economic opportunities.1 This influx produced notable second- and third-generation Swedish-American baseball stars like Charles “Swede” Risberg and Freddie Lindstrom. But only four Swedish-born players made the big leagues. Collectively they appeared in just 149 major-league games.2 Pitching for the Giants, Tigers, and Senators in an eight-year career (1914-22), Eric Erickson accounts for 145 of these. Swan Erickson and Selma Larson arrived in the early 1880s and were married several years later. Swan became an American citizen, and three of the couple’s four children were born in the United States.3 But one, Eric George Adolph Erickson, arrived in Vargarda, Sweden, on March 13, 1892, as his parents were visiting their native land. Eric spent his childhood in Johnsonburg, Pennsylvania. In 1908 the family moved 60 miles north to Jamestown, New York, a regional magnet for Swedish-Americans.4 Per the 1910 census both Swan and Eric worked at a Jamestown factory, the father as a night watchman, his son as a machinist. By 1912 Eric was pitching for the Leroe semipro team in the neighboring town of Celoron. One day, Don Curtis, a visiting Dallas Giants scout, spotted the strapping right-hander throwing heat. “Do you think you can throw that hard and get away with it at Dallas in the Texas League?” Curtis asked Erickson. “I think so,” came the reply. “At least, I’d like to try.” It was, he later recalled, an easy decision: “Leroe was paying me $3 a game, so the $60 per month Dallas was paying me looked pretty good.”5 In 1914 Erickson reported to Dallas for spring training. The New York Giants trained in Marlin, Texas, and Erickson faced one of their squads that March. There he caught John McGraw‘s eye and, in early July, the Giants purchased him for $2,000.6 Erickson went 11-19 for a Dallas squad which finished 67-83. After the Texas League season ended in mid-September, he reported to New York.7 Over the next few weeks the Braves blew past the Giants in the pennant race. In the second game of an October 6 doubleheader against the Phillies, the last game of the season, McGraw gave the newcomer a start. Shaky, Erickson yielded eight hits and three walks in five innings of work. But, with only a couple regulars in the New York lineup, the fielding behind him “was not even up to Texas League standards.”8 He gave up seven runs, all unearned, and took the loss, 8-0. Healthy, his wildness tamed, and with a “combination shine ball and spitter” added to his repertoire, Erickson won the PCL pitching triple crown in 1917.23 In addition to a 31-15 record, he sported a sparkling 1.93 ERA, and struck out 307 batters in 443 2/3 innings.24 Detroit wasted no time in negotiating a deal to reclaim Erickson from San Francisco. Little did he realize that his season was over: several games later Erickson was shelved with a sore arm, and then he was drafted into the army. He spent his WWI service at Fort Dix, New Jersey, with the 153rd Depot Brigade, and on January 24, 1919, he was honorably discharged as a sergeant. Erickson finished the 1918 campaign with a 4-5 record and a 2.48 ERA over 94 1/3 innings. Detroit slid to a 55-71 seventh-place finish. As the 1919 season began, a knee problem — its legitimacy questioned by the Detroit press — kept Erickson mostly out of action.31 In mid-May he was threatened with suspension by Navin and Jennings unless he returned to game shape.32 On June 25, 1919, after appearing in only three games with Detroit, he was dealt to Washington for right-handed pitcher Doc Ayers, who had recently stumbled with the Senators. “I have long been sweet on Erickson,” Senators manager Clark Griffith stated, and he immediately put the newcomer into the starting rotation.33 Erickson finished his 1919 season with the Senators with a 6-11 record and a 3.95 ERA. In the nation’s capital, he presented no problem to the team’s management, as was true at every other stop in his career, save Detroit. It’s probably fair to conclude Erickson’s relationship with Jennings was indeed poisonous. Before the 1920 season, MLB outlawed the shine-slash-spitter Erickson had relied upon, and he was not among the 17 pitchers whose slippery repertoire was grandfathered. For whatever reason—changes in the pitching rules, or a loss of velocity—his ability to overpower hitters diminished. Before 1920 he had struck out five hitters every nine innings, an impressive Deadball Era accomplishment.34 In 1920 he struck out 3.3 batters every nine innings, and achieved a 12-16 record and a 3.84 ERA. Washington finished in sixth place with a 68-84 record. That October, Erickson married Alma (nee Bergquist) Anderberg, a young widow, who also had been born in Sweden and resided in Jamestown. Their only child, son Burwin, arrived the next year. During 1921’s spring training, Erickson began to use “a sort of half side-arm and half under-hand delivery.”35 The Senators climbed into fourth place with an 80-73 mark. Erickson, as the fourth starter, finished with an 8-10 mark and a 3.62 ERA. The retrospectively-calculated ERA+ of 114 he achieved that season was his career-best. In November 1921, Griffith sought to deal Erickson to Portland for some of their young pitching talent. But the Yankees refused to let him pass through waivers.36 Next, he was rumored to be a piece in a three-way trade, with the Athletics and the Red Sox, which would bring Roger Peckinpaugh to Washington.37 Though the deal went down, Erickson was not included. Consequently, the veteran stayed with Washington in 1922, stumbling to a 4-12 record and a 4.96 ERA. The Senators also fell backwards, landing in sixth place with a 69-85 record. That December, Washington dealt him to the American Association’s Minneapolis Millers. In Minnesota, Erickson went 7-25 in 1923. He appeared in a handful of games for the Millers the next season, before league rivals Toronto obtained him in December 1924. After a brief turn with the Maple Leafs in 1925, he returned home to Jamestown. This biography was reviewed by Tom Schott and fact-checked by Chris Rainey. The author is grateful to Linda Erickson for generously sharing her knowledge of her grandfather’s life. 1 For statistics, see U.S. Department of Homeland Security, Yearbook of Immigration Statistics, 2015, http://tinyurl.com/gropsp6, accessed March 19, 2017. For background, see “Swedish Immigration to North America,” Swenson Swedish Immigration Research Center (Augustana College), http://tinyurl.com/mrrdn5a, accessed March 19, 2017. 2 In addition to Erickson, Charlie Hallstrom pitched one game for the 1885 Providence Grays, Charlie Bold appeared in two games with the 1914 St. Louis Browns, and Axel Lindstrom pitched one game for the 1916 Philadelphia Athletics. 3 E. A. Batchelor, “Erickson Related to Civil War Hero,” Detroit Free Press, March 4, 1916. 4 “Eric ‘Swat’ Erickson, Noted Ballplayer, Dies,” Jamestown Post-Journal, May 20, 1965. 5 Frank Hyde, “Frankly Speaking,” ibid. Hyde (likely relaying the memories of Erickson) identifies “Jack Curtis, an oldtime Texas League infielder” as the scout. But the only ex-Texas Leaguer with this surname beating the bushes for Dallas circa 1912 or 1913, was the prominent scout W. D. “Don” Curtis. By 1915, Curtis would be scouting for John McGraw and the Giants. A generation later he signed Dizzy Dean to a Cardinals contract. 6 “‘Swat’ Erickson,” Jamestown Evening Journal, July 6, 1914. 7 Heywood Broun, “Matty Triumphs, but Giants Fall to Gain,” New York Tribune, September 12, 1914. 8 Ibid., “Giants End Season with an Even Break,” October 7. 9 “International League,” Sporting Life, April 24, 1915, 16. 10 Francis C. Richter, ed., The Reach Official American League Base Ball Guide for 1916 (Philadelphia: A. J. Reach, 1916), 191. 11 “Bad Twirling Loses One Game; Buffalo Errors Help Hustlers to Annex Other,” [Rochester, NY] Democrat and Chronicle, August 14, 1915. 12 “Hustlers Are Triumphant, In Their Final Contest of 1915 Pennant Campaign,” ibid., September 19. 13 H. G. Salsinger, “Figures Big Item in Erickson Deal,” The Sporting News, February 10, 1916, 6. 14 “Special Powers May Be Granted to Scout Rickey,” St. Louis Post-Dispatch, February 3, 1916. 15 H. G. Salsinger, “Sullivan to Boss First Tiger Squad,” The Sporting News, February 17, 1916, 5. 16 E. A. Batchelor, “Erickson Appears to be Best of the Detroit Recruits,” Detroit Free Press, March 12, 1916. 17 Contemporary accounts provide sometimes conflicting glimpses of Erickson’s pitching style. The pitcher himself spoke of pitching overhand throughout his major-league days. See “‘Swat’ Erickson Picks the Yankees,” Jamestown Evening Journal, October 10, 1923. But sometimes Erickson’s statements in his hometown newspapers are cloudy. Certainly, in 1921, Washington newspapers frequently referenced a sidearm delivery, suggesting he at least temporarily changed his overhand motion later. 18 “Erickson’s Aim Poor; Waco Wins,” Detroit Free Press, March 26, 1916. 19 H. G. Salsinger, “Tigers Not Ready as Season Starts,” The Sporting News, April 13, 1916, 6. 20 Ibid., “Detroit Fans Lose Faith in Their Team,” July 13, 3. 21 Reach Guide for 1916, 133. 22 A. C. Joy, “Must Have Tired of So Much Baseball,” The Sporting News, November 9, 1916, 6. 23 “Spit Ball is Big Aid,” The [Portland] Oregonian, September 9, 1917. 24 Reach Guide for 1916, 188. 25 “Tigers Go South for Only Brief Stay in Training Season,” Chicago Tribune, February 10, 1918. 26 H. G. Salsinger, “So Far So Good is Report on Detroit,” The Sporting News, April 11, 1918, 3. 27 Charles Leerhsen, Ty Cobb: A Terrible Beauty (New York: Simon & Schuster, 2015), 312. 28 H. G. Salsinger, “In Other Words It’s No Team at All,” The Sporting News, May 16, 1918, 2. 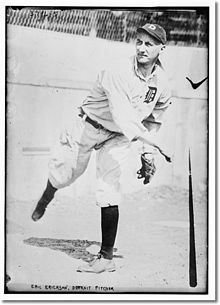 29 For a game account, see Harry Bullion, “Tigers Come Out on Small End of Score When Hughie Sends Erickson to Mound,” Detroit Free Press, April 19, 1918. 30 For a game account, see Harry Bullion, “Nationals and Tigers Go Sixteen Innings Without Reaching Any Decision,” ibid., May 25. 31 Harry Bullion, “Pitching Problem Should Not Be Hard for Hughie to Untangle This Season,” ibid., January 26, 1919. 32 Ibid., “New Faces, Stern Methods of Handling Recalcitrant Tigers is Navin’s Course,” May 17. 33 “Erickson Reports Friday to Griff,” Washington Times, June 26, 1919. 34 Erickson pitched just 262 innings before 1920, but only 11 other pitchers throwing at least that many innings from 1900-1919 topped his 5.08 strikeouts per nine innings. 35 Louis A. Dougher, “Looking ‘Em Over,” Washington Times, March 27, 1921. 36 Ibid., “Griff Seeks Pitchers, Has His Eye Upon Two,” November 20, 1921. 37 Ray Helgesen, “Three-Cornered Deal Hinges on Connie Mack,” Washington Herald, January 5, 1922; ibid., January 10, 1922. 38 “Swat Erickson Limits Boston Club to One Dinky Hit in Nine Innings and Spiders Apply Whitewash, 3-0,” Jamestown Evening Journal, August 8, 1930. 39 Background on Erickson’s post-baseball life: Linda Erickson, phone interview with the author, March 21, 2017.